Figure 1: Experimental multiple lamination of a heterogranular mixture of sediments due to dry flow at a constant rate. The author on both occasions was Guy Berthault, and his important experiments have demonstrated how multiple laminations form spontaneously during sedimentation of heterogranular mixtures of sediments in air, in still water, and in running water (see Figure 1). In subsequent research Berthault has teamed up with Professor Pièrre Julien in the Engineering Research Center of the Civil Engineering Department at Colorado State University, Fort Collins (USA). 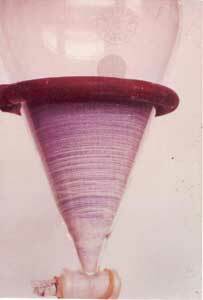 We published their results in 1994,5 after their research had been published by the Geological Society of France.6 Their sedimentation experiments are continuing. Figure 2: Fine layering was produced within hours at Mt St Helens on June 12, 1980 by hurricane velocity surging flows from the crater of the volcano. 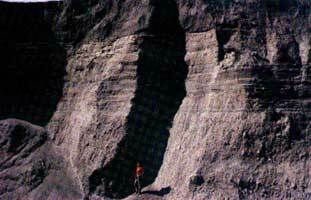 The 25-foot thick (7.6 m), June 12 deposit is exposed in the middle of the cliff. It is overlain by the massive, but thinner, March 19,1982 mudflow deposit, and is underlain by the air-fall debris from the last hours of the May 18, 1980, nine-hour eruption. Now Nature has finally caught up! That is, the weekly international science journal Nature, arguably the world’s leading scientific publication, has just published and commented upon the results of experiments similar to those performed by Berthault,11,12 thus finally acknowledging what a creationist researcher has been demonstrating for more than ten years. However, not surprisingly, Berthault’s work is neither mentioned nor referenced in the Nature articles. And what did the Nature authors discover? Makse et al. found that mixtures of grains of different sizes spontaneously segregate in the absence of external perturbations; that is, when such a mixture is simply poured onto a pile, the large grains are more likely to be found near the base, while the small grains are more likely near the top.13 Furthermore, when a granular mixture is poured between two vertical plates, the mixture spontaneously stratifies into alternating layers of small and large grains whenever the large grains have a larger angle of repose than the small grains. Application—the stratification is related to the occurrence of avalanches. Fineberg agrees.14 Both the stratification and segregation of a mixture of two types of grains can be observed to occur spontaneously as the mixture is poured into a narrow box, the mixture flowing as the slope of the ‘sandpile’ formed steepens. When the angle of repose of the larger grains is greater than that of the smaller grains, the flow causes spontaneous stratification of the medium to occur, and alternating layers composed of large and small particles are formed, with the smaller and ‘smoother’ (lower angle of repose) grains found below the larger and ‘rougher’ grains (there was a beautiful colour photo in Nature). Even within the layers, size segregation of the grains occurs, with the smaller grains tending to be nearer the top of the pile. We are naturally heartened by this ‘high-profile’ confirmation of Berthault’s experimental results, but readers of Nature could have read all about it more than a decade ago in the Creation Ex Nihilo Technical Journal. However, what this also confirms is that creation scientists do undertake original research, in this case, research on sedimentation that is applicable to the catastrophic processes of deposition during the Flood, contrary to the establishment’s uniformitarian (slow-and-gradual) interpretation of the formation of such sedimentary strata. And furthermore, creation scientists not only do original research applicable to Flood geology (even if Nature doesn’t recognise it), but the type of research they do is valid and good enough to be published in peer-reviewed secular scientific journals. Berthault, G., 1988. Experiments on lamination of sediments . CEN Tech. J., [Journal of Creation] 3:25–29. Return to text. Berthault, G., 1986. Experiments on lamination of sediments, resulting from a periodic graded-bedding subsequent to deposition—a contribution to the explanation of lamination of various sediments and sedimentary rocks. Compte Rendus Acadèmie des Sciences, Paris, 303 (Sèrie II, no. 17):1569–1574. Return to text. Berthault, G., 1990. Sedimentation of a heterogranular mixture: experimental lamination in still and running water. CEN Tech. J., 4:95–102. Return to text. Berthault, G., 1988. Sedimentation of a heterogranular mixture: experimental lamination in still and running water. Compte Rendus Acadèmie Des Sciences,Paris, 306 (Sèrie II):717–724. Return to text. Julien, P. Y., Lan, Y. Q. and Berthault, G., 1994. Experiments in stratification of heterogeneous sand mixtures. CEN Tech. J., 8(1):37–50. Return to text. Julien, P. Y., LAN, Y. Q. and Berthault, G., 1993. Experiments on stratification of heterogeneous sand mixtures. Bulletin of the Geological Society of France, 164(5):649–660. Return to text. Austin, S. A., 1986. Mount St Helens and catastrophism. In: Proceedings of the First International Conference on Creationism, R. E. Walsh, C. L. Brooks and R. S. Crowell (eds), Creation Science Fellowship, Pittsburgh, Pennsylvania, Vol. 1, pp. 3–9. Return to text. Austin, S. A., 1994. Interpreting strata of Grand Canyon. In: Grand Canyon: Monument to Catastrophe, S. A. Austin (ed. ), Institute for Creation Research, Santee, California, Chapter 3, pp. 21–56. Return to text. Wilders, P., 1992. 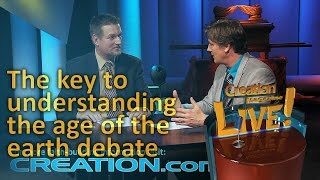 Evolution: Fact or Belief? Video, Creation Science Foundation Ltd, Australia. Return to text. Makse, H. A., Havlin, S., King, P. R. and Stanley, H. E., 1997. Spontaneous stratification in granular mixtures. Nature, 386:379–382. Return to text. 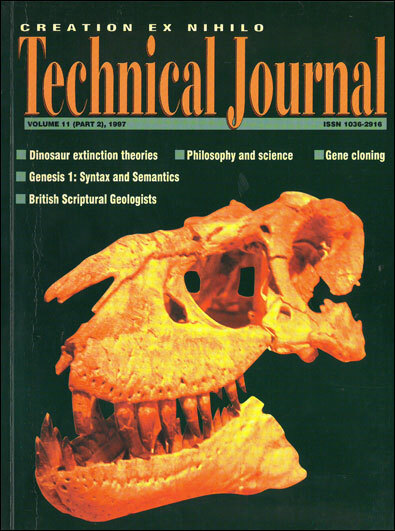 Fineberg, J., 1997. From Cinderella’s dilemma to rock slides. Nature, 386:323–324. Return to text. Makse et al., Ref. 11, p. 379. Return to text. Fineberg, Ref. 12, p. 323. Return to text.